Throughout this semester, each student in our architecture design studio has been developing a unique proposal for a redevelopment and urban infill project in the Kansas City, KS, area. We have taken influence from meeting with KCK community members to talk about their desires and needs for improvement in the suburban/urban area. We have also taken inspiration from outside case studies and literatures, as seen in many of the other Connecting the Dottes blog posts. A large amount of inspiration for my project proposal stems from CHWC’s Splitlog Farm. 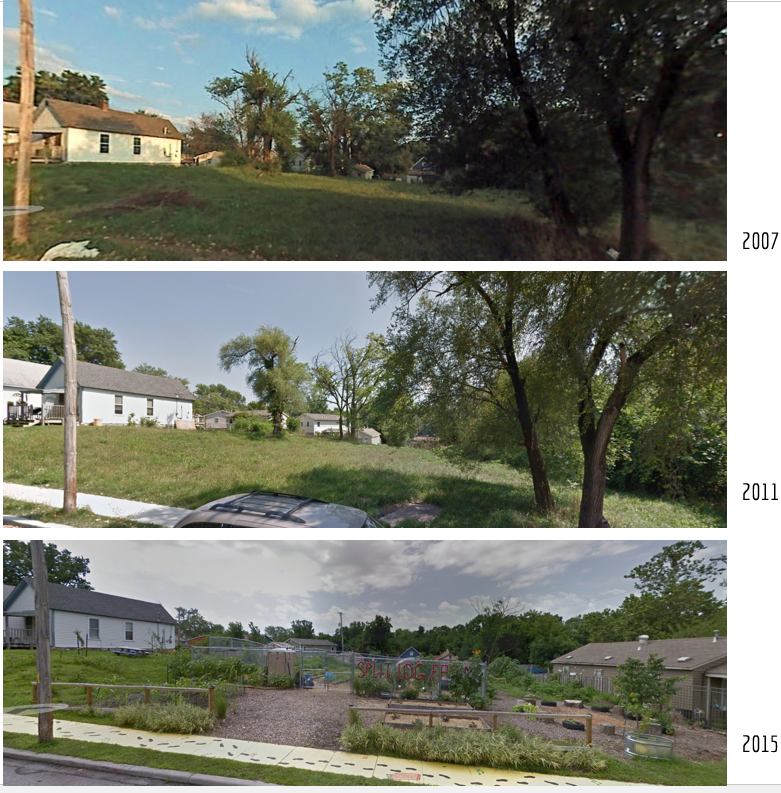 From a vacated lot that used to collect the neighborhood’s trash, this now-thriving community farm and living classroom produced over 1,000lbs of fresh produce just this year. Certain parts of the KCK area are in need of better access to fresh produce, so my project proposal has been developing around the concept of using urban pockets/land plots to host weekly fresh-produce “pop-up” markets, in addition to creating another urban community farm/living classroom. I’ve divided my project proposal into four phases that would make my project more feasible. To build a co-op from the ground up, you need donations, volunteers, and a lot of time. The volunteers in the co-op have to reach out to the community and connect with local businesses in order to gain the support needed for a stable foundation. Perhaps businesses such as El Rio Bravo, El Torito, Laura’s Panaderia y Tortilleria along Central Avenue, and even existing community gardens could donate produce to the co-op to support the pop-up markets that develop in Phase 2. This phase moves onto the execution of the pop-up markets. 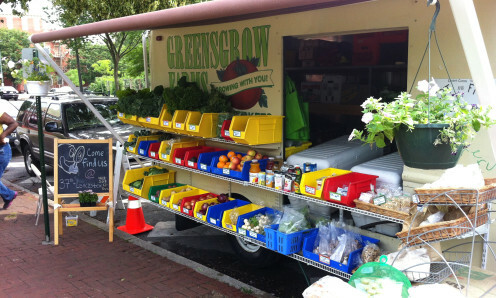 I’m imagining the markets will open from a vehicle or trailer for easy transportation, similar to a food truck. Supported by local food sources, these markets will have the foundation for selling fresh produce at weekly or bi-weekly markets along Central. They will also act as information hubs for the community, getting the word out about community events and organizations. Ideally the co-op membership will increase during this phase as well. I will focus on four locations along Central to place the pop-up markets: Lally Park (10th and Central Ave.), Flatiron Park (14th and Central Ave.), and two grassy land plots along Central Ave. – one at the corner of 13th and Central, the other in the Family Dollar parking lot just east of 13th. No longer focusing on just the pop-up markets, this phase focuses on the expansion of the co-op for educational opportunities. The first element of expansion will be creating an urban community farm on the vacant lot where the Bethany Medical Center used to be. This farm can be a temporary fix for the space before it is ready for development. The farm would be owned by the co-op and ideally become the primary or sole supplier for the pop-up markets for fresh, local produce. Any and all community members are welcome to develop plots in the farm. The second purpose for this urban farm would be to act as a living classroom for after school programs held by the co-op. Kids from all around the area would be encouraged to attend these programs to learn about gardening, healthy eating, and food preparation. CHWC has done an awesome job at starting school programs like this at Splitlog Farm, teaching kids about different plants and produce and how to grow them. This phase reveals the ultimate goal of this project, which will be to use a vacant lot along Central Avenue to develop a building with both residential and community spaces that will be the home base for the co-op. The building will be 3-4 stories of residential space, and a community kitchen and vendor space on the ground level. The site I’m looking at for this building is at 12th and Central, just across the street from Bethany Park, which is ideal for its proximity to all the pop-up market locations. The general program of the building incorporates the co-op’s expansion of education. The large kitchen space will be partially used to host culinary classes where any and all community members are welcome to take classes on healthy eating and food preparation. Otherwise, the kitchen will be available to all community organizations for individual use and events. Other portions of the program include administrative space for the co-op. There will be plenty of food storage for the co-op’s markets and surplus from local growers. Also, there will be a large interactive space where vendors from several different organizations can set up at individual stands within the building for larger community events. For a more in-depth look at my project proposal with supporting images, you can check out this Pecha Kucha from our recent presentations to a small group of KCK community members.